Educators often talk of an "opportunity gap"— academic achievement differences between students who come from privileged backgrounds and those who are less fortunate. Carnegie Mellon University’s Amy Ogan sees this gap as both a challenge for technology and an opportunity to do better. "It’s exciting to me to think about the ways we can use technology beneficially rather than just giving further advantages to a group that already has them," said Ogan, assistant professor of human-computer interaction. For the last nine months, she has been leading a working group charged with reviewing published research to better understand how educational technologies may actually perpetuate this opportunity gap rather than resolve it. This effort was supported by CMU’s Simon Initiative, a strategic effort to advance and accelerate leading work in learning science, educational technology and data-driven, continuous improvement by using the university as its own research lab. 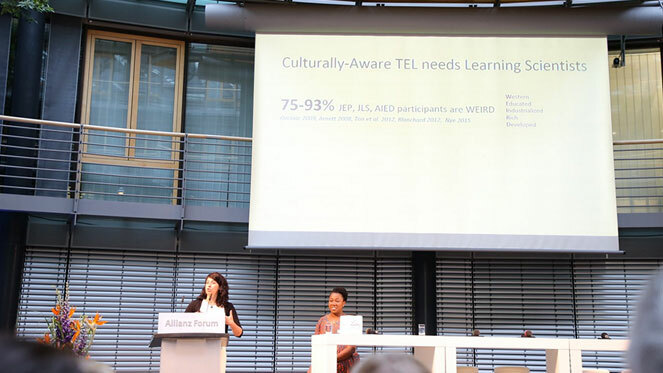 Ogan and other Simon Initiative members presented on this and other issues around around technology enhanced learning (TEL) at the 2017 Global Learning Council Summit in Berlin, Germany. In their talk, Ogan and Judith Uchidiuno, a Ph.D. student in human-computer interaction, revealed a discouraging trend: up to 93 percent of education research comes from just a small group of predominantly white, rich and educated countries. "Sometimes people are presenting their perspectives as universal even though they’re only testing them on white American college students," said Ogan. The shortcomings in this approach become crystal clear when technology developed with US students in mind gets used around the world. For instance, Ogan’s research has shown that students in countries like Chile, Costa Rica and Brazil collaborate up to three times more than those in the United States. That means that tutoring programs designed to adapt to individual learners—great for fiercely independent North American students—aren’t as effective for their South and Central American peers. Language barriers can also create difficulties. In the very multilingual Philippines, classes are taught solely in English. But Ogan and her local collaborators discovered that students working on frustrating math problems often revert to their home language, a shift that English-language computer programs aren’t able to pick up on. "There’s a huge missed opportunity to be able to detect when this is happening because that’s when these students need the most support," she said. Ogan and her collaborators hope to integrate lessons like these into the next generation of educational technology, including massive classes distributed through the internet, to help close the opportunity gap by creating systems that can adapt to the learning needs of students who come from different cultures. This research is about making sure that an education is available to people all over the world, said Uchidiuno. "But an appropriate education," she stressed. "Not just handing them a tablet." Ogan is putting this approach to practice by supporting the development of CMU’s RoboTutor, an educational technology that teaches children basic math and reading skills in English and Swahili led by CMU’s Jack Mostow. It is a semifinalist in the $15 million Global Learning XPRIZE Competition. Richard Scheines and Lauren Herckis’ GLC presentation on "Walking the Talk – Overcoming Barriers to Implementation of Best Practices in TEL for Higher Education" has been making headlines since the late June event. Times Higher Education published "Academics 'Fail to Change Teaching Due to Fear of Looking Stupid,'" which was then picked up by Inside Higher Education, e-Literate and many other blogs and outlets and sparked an intense conversation about why professors do not use TEL tools. "The resulting media coverage and debates on social media were really great, but understanding and developing strategies to overcome obstacles is a complicated problem, and potential embarrassment for professors is really just one small piece of the larger puzzle. Our work has demonstrated that faculty care deeply about their students, want them to have a good educational experience and do not want to waste their time," said Herckis, a research scientist for the Simon Initiative who, thanks to a $1 million grant from the Carnegie Corporation of New York, has been leading an anthropological investigation into TEL adoption barriers. To set the record straight, Herckis, Scheines, dean of the Dietrich College of Humanities and Social Sciences and faculty lead of the Simon Initiative, and Joel Smith, Distinguished Career Teaching Professor of Philosophy, wrote an opinion piece for Times Higher Education, "Failure to Embrace New Teaching Techniques Not Just About Fear of Embarrassment."